Basic knowledge and a few good recycling-tips are all you need to begin to reduce your carbon footprint. 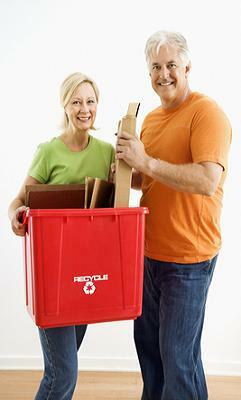 Using recycling-bins and boxes can jump-start a much greener lifestyle. The trick is to make it a habit within your household for all family members. An obsession would be even better. You are bound to come up with your own recycling-tips and new resources as time goes on. Don't wait for the "special containers" or special recycling-bins everyone else is using. You will get them eventually. Get a cardboard box or an old laundry basket and place it right beside your garbage can. Putting it there for the moment will remind you to follow through with the process. Take a moment and call your local town office. Ask for some containers (which are usually blue or green) and for their schedule for pickup. These containers are usually free as well. As for the schedule, where I live different kinds of recyclables are picked up on alternate weeks on our garbage day. Ask what items are acceptable. Not everything is ok to put in your container-boxes. These items might typically be light-bulbs, window glass and styrofoam to name a few. Other arrangements have to be made for those items and hazardous waste as well. Your area will have specific recycling rules, so be sure to find them out. In the meantime, typical acceptable items for recycling are divided into Fiber Boxes and Container-Boxes. Paper Products- envelopes, magazines, newspapers, cereal and kleenex boxes, computer paper, catalogues etc. Egg cartons, milk and juice cartons, broken down corrugated cardboard. Give the food containers a quick rinse first. You don't have to but it's nicer for you, nicer for the garbage-man, and keeps animals away. You will figure out the sorting process eventually, and if it's NOT an acceptable item, the garbage-man will leave it behind. Trust me, he will! Plastics actually are numbered in sizes that are marked inside a triangle and found on the underside of the container. Newspapers and pieces of cardboard are usually required to be tied with string in some way. Again, don't worry. You will learn the specifics for your area eventually and recycle more efficiently. Toxic Garbage Disposal advice for those questionably dangerous items. How Can I Recycle Old Tires? Each person adds 2-5 pounds of garbage per day to our landfills. Burning a plastic container in the dump uses twice as much energy than it would take to just recycle it. If everyone re-used a paper bag for one trip to the store, 60,000 trees could be saved. Recycling one aluminum can produce 3 hours worth of energy to operate a television set. Proper Electronic Hardware Recycling Is A Must! Learn to Compost. Compost as much kitchen waste as possible and keep it out of your green garbage bag. Besides, it's like gold for your gardens. This is probably one of the best recycling-tips there are. Flatten cardboard and dry food boxes. They will fit your container-boxes, and the garbage-men won't complain. Rinse out food-containers. Avoid odors that may attract your pets and other wildlife. And, YOU don't want to smell it either. Consider if any of the recyclables can be re-used? Plastic containers make great scoops, and large pop containers can be turned into bird-feeders. Could a local community agency benefit from your plastic bags? Could they benefit monetarily from your bottles for their bottle-drives and fundraising activities? Tip: Switch to canvas bags to avoid accumulating the plastic bags in the first place. What about magazines? Why not donate them to a hospital for reading material, or even a library. How about giving them to a friend? Ask around. Pet Shelters are always screaming for used towels, sheets and things of that nature for the animals. Kids cut up magazines and catalogues for school crafts frequently. Large plastic coffee containers are great. I love these things for Christmas baking. I find they hold a lot and everything freezes well. My husband uses a number of them for sorting nails and that kind of thing. Dispose faithfully and properly of old paint and chemicals. Pay attention when your local landfill advertises the specific date for this, usually in the spring when everyone is doing a major house-cleaning, remodel, construction etc. Feng Shui Elements are just a part of true Feng Shui and what it all means. A great way to live in terms of serenity, harmony in life and being very organized! De-clutter as much and wherever possible. Donate or give away any items you might be tempted to hide in the garbage bag or pay extra to dump. Take your recycling-tips knowledge to work. Get detailed facts on just What Is Recycling? Decluttering your home presenting problems? There may be some explanations. Read up on decluttering. Keeping your home decluttered and clear of junk and mess serves another purpose, especially if you think you and your family are suffering from bed bug bites , which seem to be making a comeback in a big way. Do you have an office recycling process in place? Office environments can learn to implement a number of viable recycling-tips to cut down while saving company money at the same time. Have a garage sale. Let your junk be another persons' treasure. Make a few dollars at the same time. If you want to run a good garage sale, see this handy garage sale tips guide for smooth sailing through it. Stop junk mail from arriving in your mailbox in the first place. Take steps to attempt to put an end to it today. Learn the commonest recycling symbols to help you with your sorting. Keep the garbage man happy!! Keep educating yourself. Learn as much as you can about the recycling process. These are just some simple and basic recycling-tips that can go a long way to preserving our surroundings. But it also makes us take notice of what we consume and the waste we all generate. Recycling is a good family learning experience, as future generations will be well trained in the art of decreasing waste, use of good recycling-tips and will be respectful of the planet at the same time. And, just about everything can be recycled these days, even into handbags. If you are looking for a great resource of information, please visit recycled products at Natural Living For Women.